Brought to feed the slaves in the West Indies by Captain Bligh, of HMS Bounty fame. 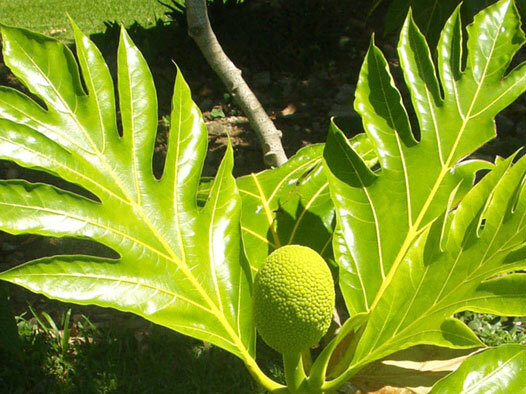 Peel the breadfruit and cut into chunks...remove the centre core. Boil in salted water. When soft, remove each piece separately from hot water and mash it as you remove it. This stops it getting too glutinous and sticky. Add chopped onion, shredded boiled carrot, chopped celery together with enough milk to hold the mashed fruit together. Top with grated cheese and bake at about 370F for 30 minutes. Using the same recipe as above, mix in grated cheese with the vegetables. Take a small quantity of the mixture, roll into a ball and then roll in breadcrumbs or crushed biscuit crumbs. Bake as above. Serve with callalloo (see MAY). Season to taste. Tobago hosts the International Game Fishing Tournament, a comment on the wealth of large fish in the warm seas that surround the island. However slaves were not sent out to sea to fish for obvious reasons, so fish was imported from the UK in the form of salted cod and smoked and salted herring. These two fishes have become the traditional breakfast fare for Tobagonians. They are best eaten with either ‘Fry Bake’ or Coconut Bake!